The Newfoundland is an exceptionally patient dog who fits into any kind of household providing it is big enough! Newfoundland dogs are large and beautiful, rarely displaying bad temper, unless provoked. Known for their love of swimming, Newfoundland dogs have been known to rescue many drowning victims. The exact origins of the Newfoundland dogs are uncertain. Many North Americans claim it as a native breed, while others argue that it descends from Pyrenean Mountain Dogs, brought to America by French fisherman. 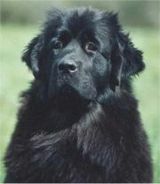 Newfoundland dogs derive their name from the island on which they were used for haulage and marine work. they are an excellent and fast swimmer, with a natural life saving instinct. As with any giant breed vigilance is required in raising and caring for Newfoundland puppies. This will be rewarded with complete devotion and constant protection. Life expectancy 8 - 10 years.